Offering Online Training for High School Journalism Teachers is being led by Candace Bowen (Kent State), Cheryl Pell (Michigan State) and Vanessa Shelton (Iowa). They are sharing information about their online courses. 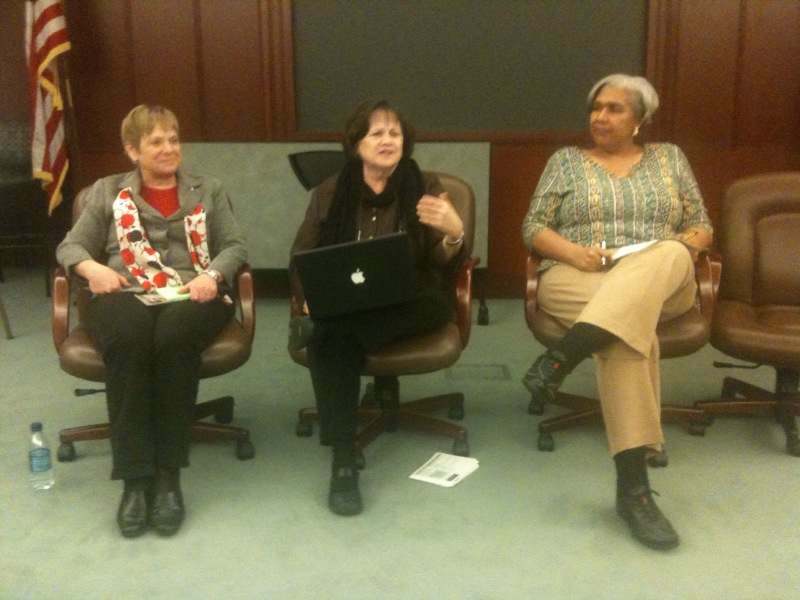 Candace Bowen (left), Cheryl Pell and Vanessa Shelton talked about rewards and challenges of offering courses online. Provide teachers with the opportunity to take classes that don’t required being on campus. That is particularly helpful for many new advisers who have childcare issues and/or can’t afford the extra costs of having to pay for housing by being on campus for a summer course. Enable journalism teachers to get courses that can help them get certified. Generate revenue for the scholastic journalism organization. University policies about course income — Getting the income from online courses can be complicated by university policies that may mean that if a student is taking courses as an on-campus students then they don’t “count” if they also take a Web-based course. Helping teachers plan for completing a degree — At Kent State students may take six hours as “guest” but must be admitted into a graduate program to continue. So it becomes a challenge to make sure courses are going to be offered so that teachers can count on those courses to enable them to get recertification. Submitting class assignments — Cheryl said that the teachers in the class would submit design materials but in different InDesign versions. The answer for that was to require that the design documents be save and submitted as PDF files. That solved that problem.